The below noted Courts are established in District Samba since 1971 to till now. 1) Pr. District & Sessions Court. 2) Sub Judge / CJM Court. 5) Addl. Spl. Mobile Magistrate Court. The Munsiff Court was established in Samba on 1971-1972 BK and Munsiff Court upgraded to Sub Court on 06.02.1982 (6th of Feb. 1982). Sh. B.D. Nayer and Sh. V K Gupta was the first and second Sub Judge in the Samba Court. In 2001, Addl. Munsiff Court was established on 28.08.2001(28th of Aug 2001). Sh. C.L. Bavoria and Ms. Rupali Ratta was the first and second Addl. Munsiff Judge in the Samba Court. Thereafter, 2003 as per direction by High Court J&K Sub Judge Court Samba was separated Munisff Court Samba on 18-08-2003 and at that time the 1st Munsiff Judge Sh. R.K Abrol and IInd Munsiff Judge Sh. Anoop Sharma in Samba Court. In the year 2007 the High Court of J&K adding CJM Court to Sub Court Samba dated 18.04.2007 and the 1st CJM was Sh. Sunit Gupta, IInd CJM was Mr Sikander Ajaam, 3rd CJM was Sh.S.R. Gandhi. In the year May 2008 Principal District and Session Court was established and the 1st Principal District and Session Judge was Sh. S.K Jamwal and IInd Principal District and Session Judge was Sh. 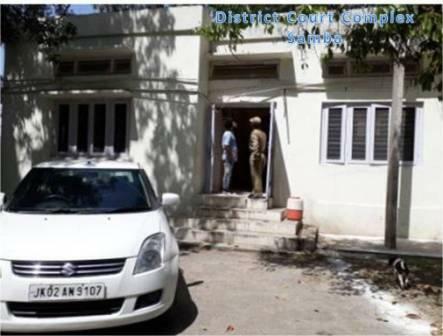 Suresh Kumar Sharma was sitting in Samba Court. The High Court has at present a sanctioned strength to Principal District and Session Court Samba is 1 Session Judges, 1 Chief Judicial Magistrate, 1 Munsiff Judge and 1 Additional Munisff Judge. Sh. Inder Singh (Pr.Dist. and Session Judge), Sh. Surjit Singh Bali (CJM), Ms. Gita Kumari (Munisff Judge) and Mrs Anjum Ara(Adll Munsiff Judge).